OISM Act II is about to appear, a not very amusing parody of the 2009 US Global Change Research Program Impacts in the United States report, brought to you by none other that Pat Michaels and friends** for the Cato Institute, a bunch so twisted that they are stealing themselves from their owners. Not yet released, but bunnies can read the preprint. Even on the cover Pat wields the eraser. 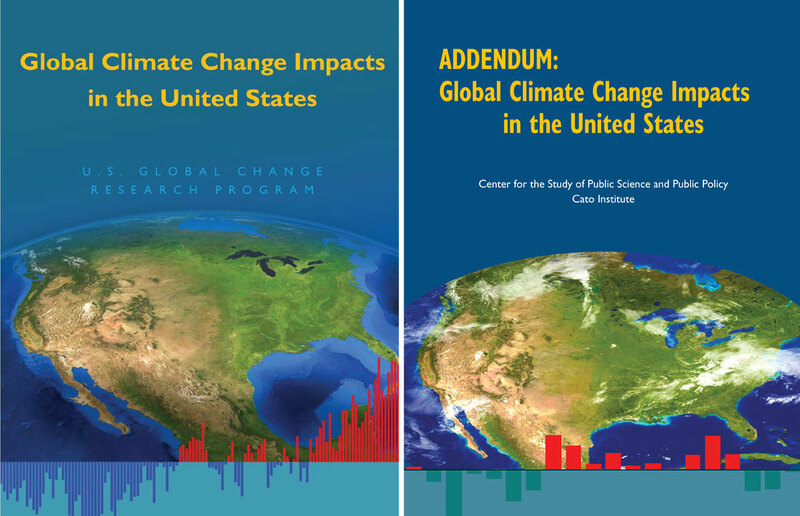 This Addendum to “Global Climate Change Impacts in the United States” is a fourth-order draft, one iteration from the final draft that will be released later this year. It is likely that there will be few, if any, changes of significant substance between this draft and the final copy. Minor typographical, format, and sequencing errors in the text and endnotes will be corrected in the final edit. As such, any subsequent revisions to this draft are likely to be minor in nature. There is a reason why Cato is putting it out now. It is not so the average person will read it. It will be handed to Republican candidates who can tout the latest science in attacking the Administration’s efforts to address climate change; and it will be used by the Republicans in the lame duck session as justification for eviscerating funding for climate change. Exactly what the OISM deception did to Kyoto. Be prepared to push at the churnalists on this one. In the official report, the bars at the bottom represent global temperature since 1900. In the CATO fake report, they represent U.S. temperature since 1991. So -- Pat Michaels also erased 90 years and over 90% of the globe. He sure does like to erase stuff. See Brad DeLong's summary of my earlier comment: love-in between CATO and RJ Reynolds, during the time Joe Camel in 3 years became as recognizable to 6-year-olds as Mickey Mouse. When an organization for years has helped tobacco companies kill children slowly, confusing people about climate is child's play. Apparently bored with deleting inconvenient data, Pat Michaels and his pals at CATO have escalated their misconduct to include forgery...what next? Remember that this are the same group who denied (deny?) the link between tobacco and cancer. Gullible Republican Senators beware, a forgery will be arriving in your mailbox soon. Wonder when good Pat's lap dog old Chip Knappenberger will arrive on the scene to defend this? "Pat Michaels also erased 90 years and over 90% of the globe." Make that about 98% of the globe. Pat seems unable to put down the mandolin he used to slice off the top of the planet. Good ol' Cato. For a while, they had Rupert Murdoch on their Board of Directors. Looking at the cover: Could Cambridge University Press sue for copyright infringement? Aside from removing the inconvenient Arctic, Cato seems to have found a version of the map that has a greener representation of the axis from Texas up to the Dakotas. Either that or they touched up a map. They've also found one with cloud that conveniently gives the impression of snow toward the north. Simple tricks, but apparently that's all that's required for GOP-smacking. The CATO Institute is where square pegs go to be pounded into round holes! Who thinks the Republican senators are gullible? Who doesn't imagine that they requested something exactly like this? It's time for his nick name to catch on. The Cato cover image is taken from some incarnation of NASA's Blue Marble 2002. The cloud cover is a version of NASA's cloud overlay, where thin clouds have been rendered invisible (the shapes still identify it uniquely as Blue Marble). Going by the vegetation this seems to be a shot from July or August. Not sure how the image was composited. Going by the distortions it could almost be the flat Earth skin posted by NASA. Maybe the used Virtual Earth or Google Earth (as they seem to have done on page 5). In any case, the cloud cover has been thinned as compared to the original and the peculiar "horizon" can only be done using a circular mask, a real projection of a sphere will not do this trick. I'm leafing through both PDFs. I consider this a prime example of layout and design plagiarism. Cato's TOC and section header graphics are clearly designed after the original. To me as a layman this looks like skating - if not crossing - the line to intellectual property theft in the visual presentation department. They did not copy the exact image, but most aspects of the image composition. It would be interesting if the USGCRP would ask for a take down because of the misleading formatting of the report. Something along the lines of while CATO is free to write anything they want, they cannot copy our look and feel which provides a misleading impression to readers that this is a USGCRP product. The US NRC should have done that with the OISM manuscript. James McCarthy, (Biological Oceanography prof, Harvard, former President, AAAS) presented this testimony in August in front of the Senate Environment and Public Works committee (chair - Barbara Boxer, ranking idiot - James Inhofe). McCarthy commented on what happened behind the scenes at that committee meeting, on the Scientific American podcast Science Talk, i.e. The Climate of Climate Science somewhere around the 12th minute. McCarthy claims "there are some very reasonable people" I assume he meant among the Republican Senators and/or House members, who "I think you can engage in discussions on this". The more cynical among us would tend to examine voting records, campaign literature, public speeches, Senators and/or House members websites, etc., for glimmers of "reasonable"ness, and I don't find a thing. Thousands agree. Eg. : this editorial in Nature. In my experience, what politicians do while cutting your throat in public with legislation is attempt to disarm you and your supporters in back rooms by shaking your hand and saying anything you might find believable in the context as long as you don't have your tape recorder running. But, maybe some of the bunnies know McCarthy and can better assess how easy it is for these "reasonable" Republicans to con him. It is in McCarthy's interest to play the same game rather than confront people who will be there forever. - from "'It Ain't True, Is It, Joe?' Youngster Asks" Minnesota Daily Star, September 29, 1920, pg. 5 News story during the Black Sox scandal. Intellectual property violation. You can easily mistake the parody for the original, by the cover. I'm reminded of the time when infamous psuedoscientists at the Discovery Institute lifted footage directly from a Harvard video on cellular processes, to fill out their own production espousing "Intelligent Design" Creationism. It's hard to parody The Amazing Michaels & the Cato Theater Company Of The Air . Uhmmm - because the cover of the report uses a different image is significant, how again? Because the design is meant to convey the impression that the CATO Addendum = is not a report generated by a bunch of third rate cranks. The cover of the fake report is clearly meant to resemble the real one, so that inattentive politicians will not realize that the fake report is crap. At best they are being derivative and unimaginative; at worse, they are being dishonest at worst they are being all three. What were people trying to convey from the cover image ( either one ) ? What were people trying to infer from the cover image ( either one ) ? Bluegrue, regarding trying to apear like the real thing is Oregon Petition all over. "...we are dismayed that the report of the Cato Institute, ADDENDUM: Global Climate Change Impacts in the United States, expropriates the title and style of our report in such a deceptive and misleading way. The Cato report is in no way an addendum to our 2009 report. It is not an update, explanation, or supplement by the authors of the original report. Rather, it is a completely separate document lacking rigorous scientific analysis and review."